Astronomie - What happened before the Big Bang? Its my lifes work to try to answer that question, University of Toronto physicist Renée Hložek says. Raumfahrt - Mars Fakers / Can we learn anything by pretending? Another view of the model of SpaceShipTwo and WhiteKnightTwo, with Pete Nickolenko, Virgin Galactic’s director of spaceline engineering, in the background. Pete Nickolenko talks in May about leaving a career at NASA in 2014 to move to Las Cruces and become Virgin Galactic’s director of spaceline engineering. “I wanted to be closer to a really special mission about launching humans back into space,” he said. 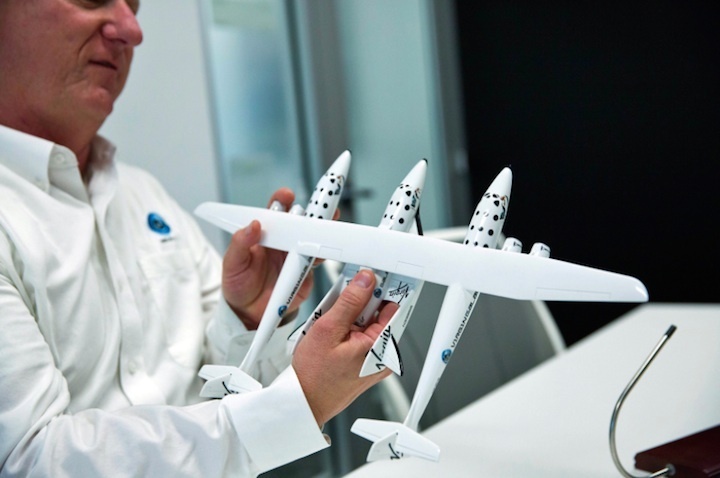 Pete Nickolenko, Virgin Galactic’s director of spaceline engineering, uses a model to explain how SpaceShipTwo, which the company is building to fly paying customers into space, and WhiteKnightTwo, the cargo aircraft designed to carry the spaceship to a release altitude closer to space, are intended to work at the company's office in Las Cruces in May. Pete Nickolenko remembers meeting with two men who would pilot SpaceShipTwo about an hour before a test flight on Oct. 31, 2014. He wished them well. The flight from a spaceport in Mojave, Calif. of the vehicle Virgin Galactic is building to fly paying passengers into space didn’t go well. Co-pilot Michael Alsbury unlocked a feathering system too early. The spacecraft wasn’t built to account for such an error. The first SpaceShipTwo broke apart mid-flight, killing Alsbury. Pilot Peter Siebold was seriously injured but survived. The accident was a massive blow to Virgin Galactic’s efforts to make space more accessible – and to New Mexico’s hopes of diversifying its economy by building a commercial space industry with Virgin Galactic’s spaceflights at its core. It set back plans to relocate Virgin Galactic employees from California to southern New Mexico and begin long-awaited flights from Spaceport America, located east of Truth or Consequences. This article is part of an NMPolitics.net series examining Spaceport America’s impact on New Mexico’s economy and future. A decade ago, the state and voters in Doña Ana and Sierra counties approved public funding to build the facility on the promise of Virgin Galactic flying paying customers into space from southern New Mexico and elected officials pledging thousands of new jobs in the tech and tourism sectors. We spent months investigating where things stand today. Dealing with disaster wasn’t new for Nickolenko, Virgin Galactic’s director of spaceline engineering. He worked for NASA’s space shuttle program in Florida for 24 years. He was in the control room when Space Shuttle Columbia disintegrated over Texas in 2003, killing all seven crew members. So after the SpaceShipTwo accident, Nickolenko helped bring people together to “focus on the task at hand,” he said in a recent interview. Virgin Galactic brought on Nickolenko months before the accident, and based his job in Las Cruces because at the time the company thought it was on the verge of moving the bulk of its spaceline operation here. But on the day of the accident he was in Mojave for the test flight. The company stopped providing public estimates of when it will begin taking passengers into space for years while it worked to fix the design flaw and complete SpaceShipTwo. With lives at stake, its reputation on the line, and facing criticism of its business model and plans, the company is focused on getting it right, Nickolenko said. Nickolenko is one of 21 full-time employees the company already has in Las Cruces, according to Jonathan Firth, the company’s executive vice president for spaceport and program development. They work out of an office off Roadrunner Parkway marked on the outside only by a small sign that illustrates the evolution of flight. The thin, vertical strip of metal points upward from bird to small plane to fighter jet to commercial airliner to NASA’s Lunar Earth Module – and then finally to Virgin Galactic’s SpaceShipOne and SpaceShipTwo. The door to the office remains locked even during business hours. Inside, Virgin Galactic’s office is techy and bright, with furniture in shades of gray and white. Visitors have to sign in on an iPad. A model of SpaceShipTwo and WhiteKnightTwo – the cargo aircraft designed to carry the spaceship to a release altitude closer to space – sits on a table in the entryway. The office is the most tangible sign in Las Cruces of the vision voters embraced a decade ago when they helped fund Spaceport America’s construction with a tax increase – a vision that has yet to become reality. Virgin Galactic’s founder, British billionaire Sir Richard Branson, recently said the company is aiming to get paying customers into space in 2018 – the first publicly-shared estimate in years. That would come long after Branson’s original estimate of 2009. Another reason for the delay was an explosion at the Mojave test site a decade ago that killed three workers. Branson’s original prediction was critical to winning about $220 million in state and local public funding to help build the spaceport, including a tax increase in Doña Ana and Sierra counties. So was then-Gov. Bill Richardson’s promise of the development of a commercial space industry that would create 5,000 new jobs. Virgin Galactic has always been called the spaceport’s anchor tenant, so its operation is critical to Spaceport America’s success. Virgin Galactic has completed several successful tests this year in Mojave, most recently on Aug. 4. Once testing there is complete, the company will move 85-90 employees to southern New Mexico, Firth said – people who were hired in Mojave with the understanding that their jobs would eventually relocate. Virgin Galactic will need to conduct additional test flights in New Mexico to ensure its spacecraft performs as expected in the different environment. Then, officials say, passenger flights will begin. “Virgin is doing some exciting things and helping to lead the commercial space industry, and we’re very fortunate to have them as our foundational partner in southern New Mexico,” said Dan Hicks, Spaceport America’s CEO. Another view of Virgin Galactic's hangar at Spaceport America. Virgin Galactic's hangar at Spaceport America. Virgin Galactic’s delays have fueled doubt in a poor state that took a risk by investing surplus cash in the spaceport during an oil and gas boom. Among the skeptics is Sen. George Muñoz, D-Gallup, who thinks Virgin Galactic’s plan is nonsense. In 2015 he unsuccessfully sponsored legislation to sell Spaceport America, which is owned by the state. Space tourism flights aren’t yet happening anywhere. Firth said “in excess of 600 customers” from more than 50 countries have signed up to fly from Spaceport America. Initially, a ticket cost $200,000, but Virgin Galactic raised the price to $250,000 in 2013. Virgin Galactic has global ambitions for its space-related companies that include operations elsewhere. But it’s primarily focused at the moment on getting things right in Mojave and then building a tourist experience in southern New Mexico centered on flights into space. Firth says the facts demonstrate the company’s commitment to New Mexico. To date Virgin Galactic has paid $7.1 million in rent and user fees to the state for its use of a hangar and other facilities at Spaceport America. Since 2010, Firth said, the company has spent another $9.4 million with New Mexico business on construction and other things. The company has “forward commitments” with Hotel Encanto de Las Cruces and billionaire Ted Turner’s Sierra Grande Lodge in T or C for its customers, Firth said. Virgin Galactic has brought some people who have paid for seats on SpaceShipTwo to southern New Mexico “to familiarize them with the environment,” he said. And several years ago the company brought about 90 travel agents from around the world to the region to learn about area attractions astronauts and their families could enjoy. The travel agents spent an afternoon in Kingston, a historic silver mining town located in the Black Range mountains west of T or C. Catherine Wanek, who owns Kingston’s Black Range Lodge, said the group watched a historic recreation of the town’s “wild west” history – a mock robbery of the historic Percha Bank and a gunfight on Main Street. The lodge catered lunch for the group. The travel agent at that event who had sold the most Virgin Galactic tickets was from Japan, Wanek said. State Rep. Bill McCamley, D-Las Cruces, co-chaired a political action committee a decade ago that helped convince voters to fund the spaceport. He said he remains optimistic. “I think when Virgin starts launching a lot of these problems solve themselves because you’re going to see more employees here and you’re going to see more people visiting, so it becomes a visible reality,” he said. But first, SpaceShipTwo must be ready for flights. Kim Sandoval will be in charge of relocating the Mojave employees when it’s time. She’s Virgin Galactic’s “people coordinator” – basically a human resources director. Sandoval speaks with a smile about her job. She is excited that her daughters will be able to witness spaceflights, she said. “I think it’s a pretty amazing thing that I can be part of the team that’s going to make that happen,” Sandoval said. She grew up in Michigan and came to the Southwest to attend the University of Texas-El Paso. She moved to Las Cruces from Santa Teresa in 2009 with her husband and started a family. Sandoval began working for Virgin Galactic as an administrative assistant last year and was promoted in January. She called Virgin Galactic a flexible employer that promotes a positive “work-life balance.” That has made it easier for her to work while also raising Annabelle, 5, and Emily, 4, she said. Nickolenko, like Sandoval, said he’s “embedding in the community.” His family owns a home in Las Cruces. His daughter is completing a master’s degree at Eastern New Mexico University in Portales. His son is studying engineering at New Mexico State University in Las Cruces. “We love the people. We love the environment. We love so much about what Las Cruces and New Mexico have to offer, and so we’ve been very thankful for the move,” he said. Virgin Galactic’s plans aren’t the whims of a rich billionaire, company officials say. The development of SpaceShipTwo and WhiteKnightTwo has cost “hundreds of millions of dollars,” says Jonathan Firth, the company’s executive vice president for spaceport and program development. The global space economy was estimated at $330 billion in 2014. The partnership between Virgin Galactic and Spaceport America puts New Mexicans in the middle of a new space race with intense competition. Tesla CEO Elon Musk’s SpaceX, based in California, currently has two spacecraft that deliver payloads into orbit. The company has flown 10 resupply missions to the International Space Station. It launches from spaceports in Florida, California and Texas. Amazon.com founder Jeff Bezos’ Blue Origin, which is based in Washington State, is developing a rocket-powered spacecraft. It’s building the engine in Alabama and testing at a private facility east of El Paso, Texas. Blue Origin has leased a facility at Cape Canaveral in Florida for launches, which are estimated to begin in 2020. Virgin Galactic began with a focus on sending paying customers into suborbital space, which means they reach space but then fall back to Earth rather than completing at least one orbit around the planet. Given the SpaceShipTwo delays and the rapidly changing industry, Virgin has created another company, Virgin Orbit, to focus on launching satellites into space. That operation is headquartered in California. Virgin Galactic remains focused on its Spaceport America plans for now, though it has its eyes elsewhere too. SpaceShipTwo could eventually fly passengers to various points around the globe more quickly than commercial airliners can. The company has said it will launch eventually from spaceports in Sweden and maybe Scotland. A firm based in the United Arab Emirates has invested big in Virgin Galactic in exchange for “exclusive regional rights” to launch from Abu Dhabi. New Mexico has advantages. Its commercial spaceport is the first facility designed and built for that purpose anywhere. Its elevation makes reaching space cheaper than from coastal facilities. The spaceport benefits from White Sands Missile Range’s no-fly zone, which means rerouting commercial airline traffic during space flights isn’t necessary like it is other places. And the growing cross-border industrial area between Santa Teresa, N.M. and Ciudad Juárez, Mexico provides cargo potential. Suborbital spaceflights to other points on the planet would be much quicker than commercial airliners can fly. The ability nearby to put cargo on a quick flight to other continents has potential. Carrying research experiments into space is another possibility, Firth said. Virgin Galactic, in that case, would be competing with other companies that are already using rockets to launch experiments from Spaceport America and elsewhere. Virgin Galactic’s plans aren’t the whims of a rich billionaire, company officials say. The development of SpaceShipTwo and WhiteKnightTwo, Firth said, has cost “hundreds of millions of dollars” – more, he said, than New Mexico’s $220 million investment in Spaceport America. “There are hundreds of people working in Mojave to make it happen, and Virgin is putting hundreds of millions of dollars’ investment into making it happen, and you better think they think it’s worthwhile,” Firth said. And the benefit to New Mexicans? The goal, Firth said, is to “create a central gravity of activity” in southern New Mexico. That’s why partnerships with hotels and others are important to creating the tourist experience high-dollar travelers expect. It’s why the growing border industrial economy is critical. It’s why local space-related educational programs, funded in part by tax dollars and with some support from Virgin Galactic, are essential for building a workforce – and providing greater opportunities for New Mexicans to stay in the state after college. That vision, if realized, would mean more good-paying jobs in a high-tech sector and additional tourism. Virgin Galactic’s Spaceship Unity, a SpaceShipTwo-class suborbital rocket-powered manned spaceplane, shown here during a test flight in California on May 1. Nickolenko speaks about Virgin Galactic’s work as more than a business. It’s a mission, he said. Virgin Galactic plans to start flights from Spaceport America with one ship, but he envisions the company needing a fleet of several. He said he expects the company’s presence in southern New Mexico to grow substantially. That optimism is fitting for Nickolenko, who lived in Florida as a child and got to witness the last of the Apollo launches to the moon in 1972. He wanted to become an astronaut, but poor vision prevented it. So he became a space engineer. Nickolenko’s job with Virgin Galactic came at the right time. While NASA has struggled to figure out how to return to space, private companies are moving ahead more quickly. Sandoval spoke with a smile about increasing human access to space. “We’re trying to focus on the good, not just for Las Cruces, but for the world and the global economy,” Sandoval said.